Industrial Heavy Duty Hoppers come in a wide range of sizes. Industrial hoppers are designed to make the collection and movement of debris easier and safer. Cranston has Industrial Heavy Duty Hoppers that are just right for your operation. Furthermore Cranston Material Handling of Pittsburgh can provide you with options from a number of manufactures. There are many Types of Industrial Hoppers ranging from hand pushed to super heavy-duty models. We can find the right type and size to help your process run at maximum efficiency. Count on Cranston Material Handling of Pittsburgh, Pennsylvania. The Cranston team has the experience to help you select the industrial heavy-duty hoppers that will make a difference in your operation. Self-dumping hoppers have steel bodies on all-welded steel frames. These types of hoppers are picked up by a forklift and are engineered to dump their loads when the locking mechanism is tripped. They can right themselves, and return to the upright locked position when empty. 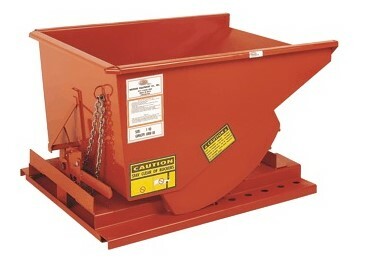 Self-Dumping hoppers are available with lids, casters, and a choice of paint colors on most units. Large Volume industrial hoppers are available in sizes up to 10 yards. These hoppers are constructed to handle large amounts of bulk material such as metal, wood, plastic, cardboard, and scrap. Low Profile industrial hoppers are a type of self-dumping hopper designed with a lower overall height. Therefore this type of hopper is often used under presses, workstations, or other pieces of equipment where space is limited. Bumper Release hoppers dump as soon as the installed bumper is pushed. Then the hoppers automatically return to a locked position. Manual Tilt Trucks are lighter weight. Also these hand pushed hoppers are made to collect and move bulky material. Chip and Waste Trucks are designed for confined areas. These trucks can make tight turns, and require less effort to dump. Cranston Material Handling of Pittsburgh, Pennsylvania is known for offering the highest level of professional help. Cranston’s sales and service team provide the best industrial equipment, project management and installation in Southwestern Pennsylvania. To speak to an experienced material handling professional about your project, call 412-741-8060 or email sales@cranston-material-handling-equipment.com today!